Don Grolnick was a subtle and rather underrated pianist throughout his career, but his flexibility and talents were well known to his fellow musicians. Grolnick played in rock bands while a teenager but was always interested in jazz. He worked in the early fusion group Dreams (1969-1971), the Brecker Brothers (starting in 1975), and in the early '80s with Steps Ahead. He has long been a busy session musician often utilized by pop singers. In the 1980s, Grolnick appeared in many settings including with Joe Farrell, George Benson, Peter Erskine, David Sanborn, John Scofield, Mike Stern and the Bob Mintzer big band. 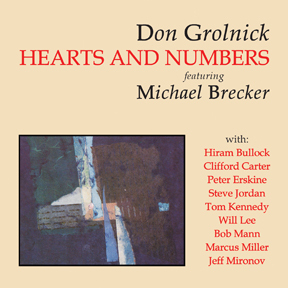 Don Grolnick is heard at his best on his 1985 debut, Hearts and Numbers (remastered and reissued in 2011 on Art of Life Records, www.artofliferecords.com), and on his two Blue Note albums, which have been reissued as a double-CD. In a short time Don became a sought-after session musician. Don eventually worked on hundreds of recordings with artists like Linda Ronstadt, Steely Dan, and Bonnie Raitt. In 1974, he began what was to become a long musical partnership with James Taylor.
. Grolnick's playing is also on a high level, and he sounds quite happy during his verbal introductions. Essential music. All About Jazz musician pages are maintained by musicians, publicists and trusted members like you. Interested? Tell us why you would like to improve the Don Grolnick musician page.